THEY SERIOUSLY BELIEVE THIS ABOUT THEMSELVES! ANYONE WHO OWNS ONE OR WHO HAS KNOWS WHAT I MEAN! HUMAN, YOU'RE TO NO LONGER KNEEL & PRAY TO THIS STATUE ABOVE! YOU'RE TO KNEEL & PRAY TO ME INSTEAD! 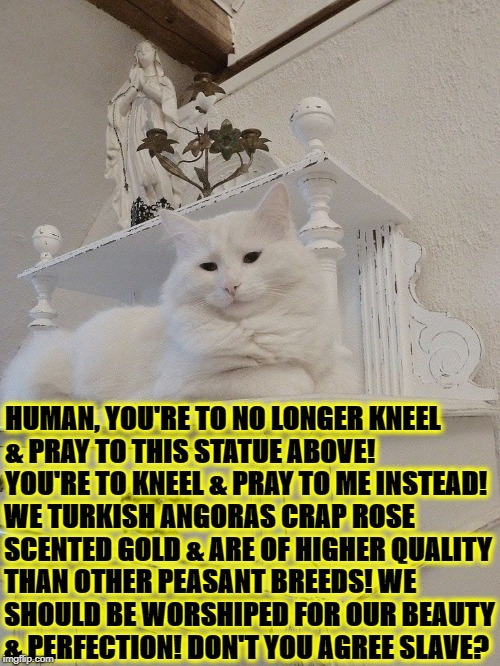 WE TURKISH ANGORAS CRAP ROSE SCENTED GOLD & ARE OF HIGHER QUALITY THAN OTHER PEASANT BREEDS! WE SHOULD BE WORSHIPED FOR OUR BEAUTY & PERFECTION! DON'T YOU AGREE SLAVE?